I got the axle out. The seal was just really stuck; I had to stick a screwdriver in at C and hit it with a hammer. I have to order that online, so I went ahead and put in an order for all of the other seals you are supposed to change any time you pull the axle and locking hub. And as long as I am waiting anyway, I ordered a set of XRF ball joints off of ebay. I hear good and bad about them off the forums, but I got tired of trying to dig through and find "the best" ball joints. They have to be better than the cheap set I was going to install from O'Reilly. Anyway, my wife doesn't want to buy flour ones for me again until I finish the corn ones. So I finally told her the other day that I'm not eating the corn ones unless they are cooked my way, and if she won't do it, I will. So, I got "uncensored" tacos tonight. See, Katherine wants to keep me healthy or something, and won't let me get a lot of grease or oil if she can help it. So my "tacos" have been with microwave-steamed tortillas. Works great for the flour ones, but leaves the corn ones with something to be desired. When I was growing up, the way we ate tacos was with the tortillas cooked in a frying pan of grease. Not crunchy, just enough that the tortillas got hot and soggy with grease. My wife has been keeping me from cooking them that way, hence the "censoring". But they sure are good. Of course, we were out of salsa. But, I had a solution; we grew a bunch of jalapeños this year in our raised bed gardens. I pickled a couple of jars and gave the rest away. One jar, I used pickling spice, since my wife bought some (I had "pickling salt" on her list, and she misinterpreted it), and just vinegar and such in the other. I didn't like the pickling spiced ones, as they were too sweet. As to the others, I didn't know if I liked them or not; see, I don't normally eat jalapeños at all. Every once in a while added to my Whataburger is about all, and I don't do that often enough to know for sure what they are supposed to taste like by themselves, especially with all the mustard and such on the burgers. So I took them to a friend's house, and they said they tasted right. I gave them the spiced ones outright, and let them pour off half the unspiced ones. I shouldn't have done that; I've started eating them on stuff, like my chili, my tacos tonight, etc. They're really good. Now, I could go down to the store and buy some more and pickle them, or even just buy a jar pre-pickled, but it wouldn't be the same. I'll just have to wait until next year, I suppose. Let me know, I'd love to hear about it, and I'm sure others would as well. Ok, so the day before yesterday, I got the snap-ring off of the axle shaft. Yesterday, I managed to get the hub off, and then I spent the rest of the night trying to get the axle shaft out. According to the forums, it should just come right out, since there should only be a single seal holding it in. Of course, the Chilton book I have is completely useless. I don't think they realize that the hub design changed around 2005, so their instructions are for a different design. I think I know what is going on based on what I have read at the forums, but I need to post over there to make sure. Because what it LOOKS like at first glance is that there isn't a way for the axle to come out of the knuckle at all, or that there isn't a way to get the seal off of the axle. There is a metal ring (A) around the back of the axle (B). This ring is sloped inward to the axle, but it isn't on the other side of the truck. I think it has deformed from me banging on the axle. It is stopped against a lip on the axle, so it can't go off that direction. C looks to be the back of a rubber seal, and is loose. I can see it move against the knuckle as I wiggle the axle. D was covering it and fell off. From the front of the knuckle, the axle is E, and I'm 90% positive that part really is "the axle". It looks like F is also part of it. It doesn't make sense for it to be part of the seal, since it is separate from the rubber (G). You can see the gap at H. So if the rubber is behind this part of the axle, and G isn't moving, it would seem that it can't be the same seal as C, and that the seal at G can't possibly come off the axle in this direction. But on looking at it more closely, F seems to have a seam on the inside edge. I think that either there are two seals, one on the front of the knuckle-to-axle junction and one on the back of the knuckle-to-axle junction, or it is one seal that has completely broken in half. Either way, I think F is supposed to be part of the seal, and is pressed onto the axle. Or it could be pressed on after the seal just to hold the seal in place or protect it from the hub bearing or something. 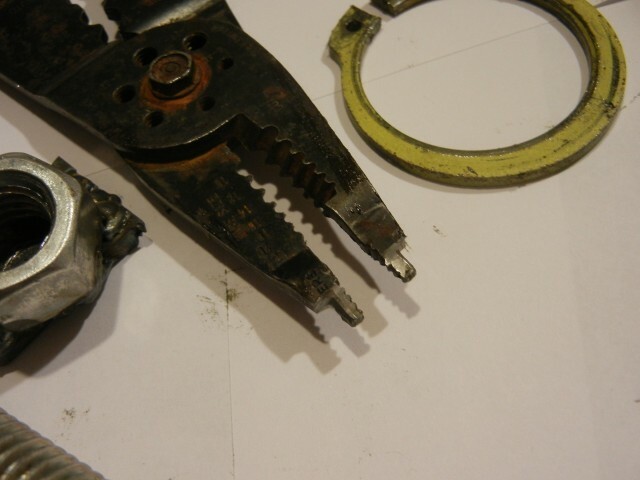 I think G is not a permanent part of the knuckle, but is the front of the seal I am supposed to be removing and has bonded itself to the knuckle. C is the back of the same seal and has separated from G completely. I need to get G out of the way to get the entire axle out, then I can pound off F, which will let all of the other pieces come loose. I'll post these pictures over in The Diesel Stop forums and see what people there say. So, we bought the new truck back in November. It's been pulling a little to the right so I decided to get the front end alignment done. Every little bit to help gas mileage. Anyway, they told me the right upper ball joint and right outer tie-rod end needed replacing. So I've been digging into that. I don't know whether it's because the previous mechanics used locktite or it's just that the truck is so much bigger than my old one, but I've had to use a cheater pipe on every major nut and bolt I've token loose. And then I finally got it torn down to the axle in the middle of the hub. Before you can take the hub loose, you have to get a snap-ring off of the axle. This ain't no standard snap-ring either. I couldn't open it my standard way (stick needle-nosed pliers in and spread them out by hand) so I borrowed a friend's snap-ring pliers. I snapped the end off. Then I bought some from Home Depot and bent the tips. Then I bought some from OReilly's and bent the tips on those as well. Searching forums, I've found that the pliers I should be using are going to run $50-$80. So, I figured I'd try something else first. 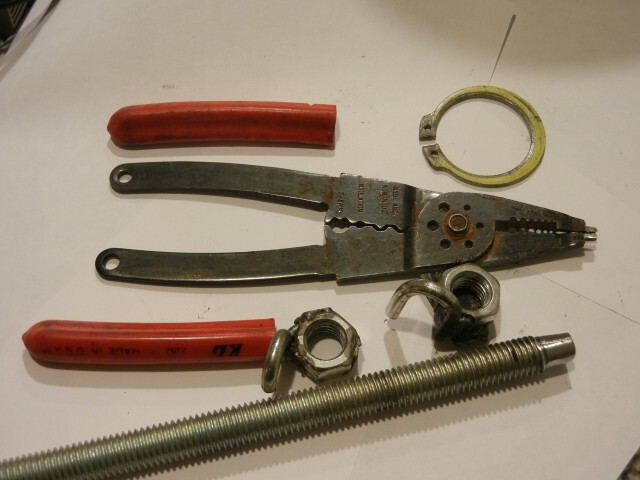 I got an old pair of wire strippers and ground the tips down so they would fit the snap-ring holes. Needle-nose would have worked, but the cutting surface was junked on these strippers anyway. Then I used a heat gun to get the handles off. I planned on drilling holes in the handles, but found that there were already holes. Since I didn't drill them, I didn't want to ream them out bigger, and I couldn't find a bolt or threaded rod small enough to go through that I also had nuts for. So I found a link of chain and cut it in half. I welded each half to a large nut (making sure they face opposite directions) and then I welded a piece of scrap iron over the hole on one of them, and then hooked the chain pieces through the holes in the handles. I ground the threaded rod down on the end so the threads wouldn't be there to engage with the nut, and then threaded it through. 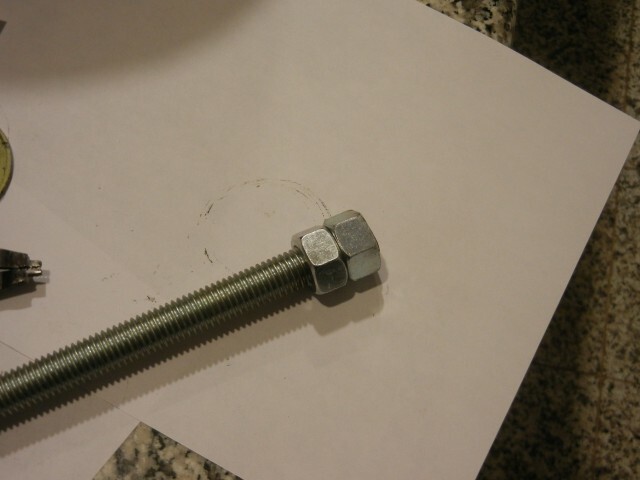 As the rod screws in, the threadless end pushes against the scrap metal on one nut, while the threads pull the other nut in the opposite direction. It makes a spreader for the pliers. It got too hard to turn by hand, so I had to put jam nuts on the end of the threaded rod so I could get a ratchet on it. After that, it worked like a charm. Pictures are below, and more will be coming eventually of each piece in a step-by-step fashion later. I weld fine on longer runs, but my starts are almost always bad. I need time to see the puddle and make sure it welds right. The welds on these nuts are so short that they are basically all starts. A lot of these welds were done in late evening, and I didn't have a good light. The threaded rod is massive overkill. 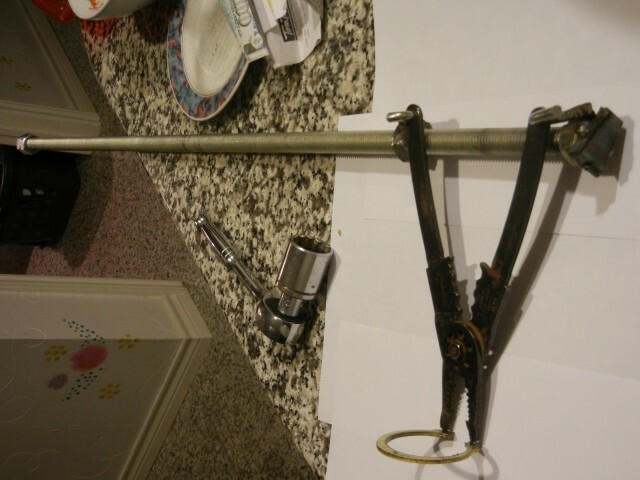 I figured a larger rod would be easier to turn by hand, but it wasn't enough. I'm also of the opinion that you can always make a rope shorter, but it's a major pain to make it longer. I feel the same way about threaded rods, so if I don't have to cut it, I won't. We bought some property out at Lake Tawakoni, and the road leading to it is private with deep pot holes. My wife won't drive her car over it (and can't in the rainy season) and won't learn to drive a stick. And the transmission on the truck started making noise a couple of months after it went in the lake. It acted like the synchronizer between first and second gear was going out. But it may have just been that I never got around to changing the gear lube in the transmission to make sure it didn't have water in it. Anyway, with Katherine's driving difficulties, the transmission problems, the plastic that had all been falling apart for years, and the fact that our son is supposed to be buying my wife's car from her, it was time to get something new. So, we started looking at 3/4 ton and 1 ton trucks. We don't need anything that big right now, but Katherine eventually wants to get a bigger RV. And I was debating on whether to focus more on 4x4 or on dually, since I doubted we'd be able to find a truck with both. (And I still wonder which actually has better traction.) But as it turns out, we found a nice 2005 F350 Dually 4x4 diesel with only 58 thousand miles on it. It was too good a deal to pass up. Of course, we greatly underestimated the poor gas mileage it would get, but oh well. We did recently visit my relatives, and we still think it costs us less in gas pulling our little 19ft travel trailer than my 1500 did, so maybe it's not so bad. Maybe it's just that we didn't realize just how bad the gas mileage in the old truck was. My truck ended up in the lake. Well, on July 4th, my truck ended up in the lake. For some odd reason, I got it in my head that leaving it running would make it easier to pull out in a hurry if something went wrong. So I had it running and was loading the boat up. I hit the trailer kinda hard, and everything looked good, so I went to shut the boat down and hook the trailer safety cables up. I heard people yell and I looked up and water was half-way up my tailgate. I jumped out but only managed to get in the truck as it died. I didn't realize until after that that the bed was up to my shoulders, and my feet weren't touching the ramp. I figure the emergency brake either came loose, or the truck started sliding when I hit the trailer with the boat. The boat is big enough that it floated the front of the trailer and the back of the truck. So once the truck went in far enough, the boat lifted the back wheels and the truck rolled the rest of the way. If I had killed it, I could have left it in gear. If the emergency brake is what gave, then at least the gears would have held. Luckily, it only rolled until it was sitting level, so the boat actually saved it. It didn't get deep enough to short the battery, since the electronics were still working, but it wouldn't start when we pulled it out. I got lucky and let it sit for 3 days while I drained the oil and it started right up. I drained the oil again, and removed the oil pan as well just to get out any standing water. I drained the power steering fluid, since it was low enough to have gone under. The master cylinder didn't go under, or the clutch fluid reservoir, so I didn't worry about those. I didn't even have to pull the spark plugs, or the dreaded buried-back-at-the-firewall distributor cap. I also noticed oil leaking out of one of my axle tubes, but I think that was probably less from the lake than from when I rebuilt the u-joints a few years back. I had probably nicked the seal then. But that would let water into the front differential, so I drained and replaced that as well, and replaced that seal (which was a major pain, since it's buried in the middle of the axle tube).